This article is about the Three Kingdoms state. For the curator, see Cao Wei (curator). The territories of Cao Wei (in yellow), 262 AD. Wei (220–266), also known as Cao Wei, was one of the three major states that competed for supremacy over China in the Three Kingdoms period (220–280). With its capital initially located at Xuchang, and thereafter Luoyang, the state was established by Cao Pi in 220, based upon the foundations laid by his father, Cao Cao, towards the end of the Eastern Han dynasty. The name "Wei" first became associated with Cao Cao when he was named the Duke of Wei by the Eastern Han government in 213, and became the name of the state when Cao Pi proclaimed himself emperor in 220. 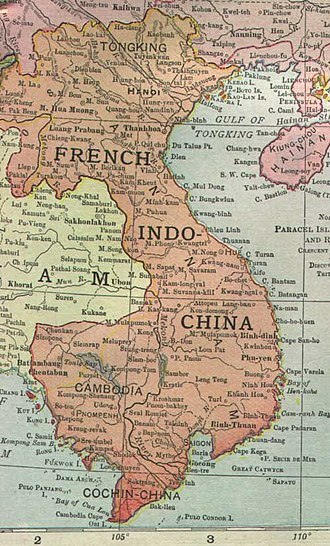 Historians often add the prefix "Cao" to distinguish it from other Chinese states known as "Wei", such as Wei of the Warring States period and Northern Wei of the Southern and Northern Dynasties. The authority of the ruling Cao family dramatically weakened in the aftermath of the deposal and execution of Cao Shuang and his siblings, the former being one of the regents for the third Wei emperor, Cao Fang, with state authority gradually falling into the hands of Sima Yi, another Wei regent, and his family, from 249 onwards. The last Wei emperors would remain largely as puppet rulers under the control of the Simas until Sima Yi's grandson, Sima Yan, forced the last Wei ruler, Cao Huan, to abdicate the throne and established the Jin dynasty. Towards the end of the Eastern Han dynasty, northern China came under the control of Cao Cao, the chancellor to the last Han ruler, Emperor Xian. In 213, Emperor Xian granted Cao Cao the title of "Duke of Wei" (魏公) and gave him ten cities as his dukedom. The area was named "Wei". At that time, the southern part of China was divided into two areas controlled by two other warlords, Liu Bei and Sun Quan. In 216, Emperor Xian promoted Cao Cao to the status of a vassal king — "King of Wei (魏王)" — and granted him more territories. Cao Cao died on 15 March 220 and his vassal king title was inherited by his son Cao Pi. Later that year, on 11 December, Cao Pi forced Emperor Xian to abdicate in his favour and took over the throne, establishing the state of Wei. However, Liu Bei immediately contested Cao Pi's claim to the Han throne and declared himself "Emperor of Shu Han" a year later. Sun Quan was nominally a vassal king under Wei, but he declared independence in 222 and eventually proclaimed himself "Emperor of Wu" in 229. Cao Pi ruled for six years until his death in 226 and was succeeded by his son, Cao Rui, who ruled until his death in 239. Throughout the reigns of Cao Pi and Cao Rui, Wei had been fighting numerous wars with its two rival states — Shu and Wu. Between 228 and 234, Zhuge Liang, the Shu chancellor and regent, led a series of five military campaigns to attack Wei's western borders (within present-day Gansu and Shaanxi), with the aim of conquering Chang'an, a strategic city which lay on the road to the Wei capital, Luoyang. The Shu invasions were repelled by the Wei armies led by the generals Cao Zhen, Sima Yi, Zhang He and others; Shu did not make any significant gains in the expeditions. On its southern and eastern borders, Wei engaged Wu in a series of armed conflicts throughout the 220s and 230s, including the battles of Dongkou (222-223), Jiangling (223) and Shiting (228). However, most of the battles resulted in stalemate and neither side managed to significantly expand its territory. After Guanqiu Jian failed to subjugate the Gongsun clan of the Liaodong commandery, it was Sima Yi who, in June 238, as the Grand Commandant (太尉), launched an invasion with 40,000 troops at the behest of Emperor Cao Rui against Liaodong, which at this point had been firmly rooted under Gongsun control for 4 decades. After a three-month long siege, involving some assistance from the Goguryeo Kingdom, Sima Yi managed to capture the capital city of Xiangping, resulting in the conquest of the commandery by late September of the same year. 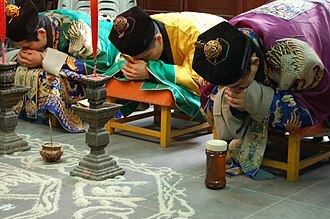 Around that time, as the Korean kingdom Goguryeo consolidated its power, it proceeded to conquer the territories on the Korean peninsula which were under Chinese rule. Goguryeo initiated the Goguryeo–Wei Wars in 242, trying to cut off Chinese access to its territories in Korea by attempting to take a Chinese fort. However, Wei responded by invading and defeated Goguryeo. Hwando was destroyed in revenge by Wei forces in 244. In 249, during the reign of Cao Rui's successor, Cao Fang, the regent Sima Yi seized state power from his co-regent, Cao Shuang, in a coup. This event marked the collapse of imperial authority in Wei, as Cao Fang's role had been reduced to a puppet ruler while Sima Yi wielded state power firmly in his hands. Wang Ling, a Wei general, tried to rebel against Sima Yi, but was swiftly dealt with, and took his own life. Sima Yi died on 7 September 251, passing on his authority to his eldest son, Sima Shi, who continued ruling as regent. Sima Shi deposed Cao Fang in 254, on grounds of planning to stage a rebellion, and replaced him with Cao Mao. In response, Guanqiu Jian and Wen Qin staged a rebellion, but were crushed by Sima Shi in an event that nevertheless took a heavy toll on Sima Shi's health, having undergone eye surgery prior to the insurrection, causing him to die on 23 March 255, but not before handing his power and regency over to his younger brother, Sima Zhao. In 258, Sima Zhao quelled Zhuge Dan's rebellion, marking an end to what are known as the Three Rebellions in Shouchun. In 260, Cao Mao attempted to seize back state power from Sima Zhao in a coup, but was killed by Cheng Ji, a military officer who was serving under Jia Chong, a subordinate to the Simas. After Cao Mao's death, Cao Huan was enthroned as the fifth ruler of Wei. However, Cao Huan was also a mere figurehead under Sima Zhao's control, much like his predecessor. In 263, Wei armies led by Zhong Hui and Deng Ai conquered Shu. Afterwards, Zhong Hui and former Shu general Jiang Wei grouped and plotted together in order to oust Sima Zhao from power, however, various Wei officials turned against them when it was found out that Jiang Wei had urged Zhong Hui to get rid of these officials before the planned coup. Sima Zhao himself received and finally accepted the nine bestowments and the title Duke of Jin in 263, and was further bestowed with the title King of Jin by Cao Huan in 264, but he died on 6 September 265, leaving the final step of usurpation up to his eldest son, Sima Yan. On 4 February 266,[a] Sima Zhao's son, Sima Yan, forced Cao Huan to abdicate in his favor, replacing Wei with the Jin dynasty on 8 February 266. [c] Cao Huan himself was spared, though, and continued to live until 302, before dying. 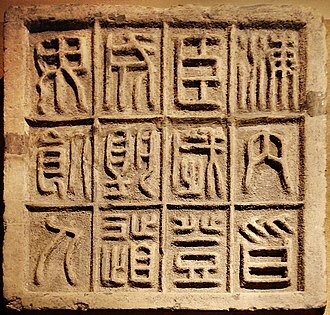 The system of government in Wei inherited many aspects from that of the Eastern Han dynasty. During his reign, Cao Pi established two separate government bodies - the Central Inspectorate (中書監) and the Mobile Imperial Secretariat (行尚書臺) — to reduce the authority of the Imperial Secretariat (尚書臺) and consolidate the power of the central government. 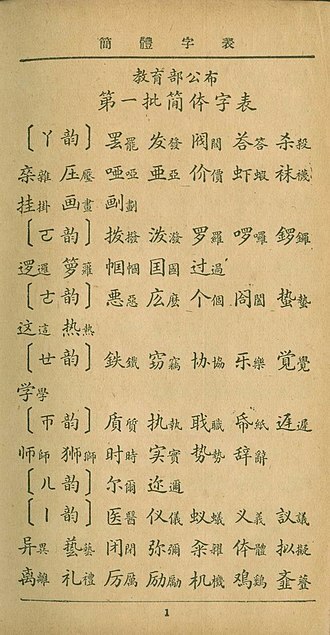 During this time, the minister Chen Qun developed the nine-rank system for civil service nomination, which was adopted by later dynasties until it was superseded by the imperial examination system in the Sui dynasty. Cao Pi felt that the Han dynasty collapsed because the Governors (州牧) of the various provinces wielded too much power and fell out of the control of the central government. 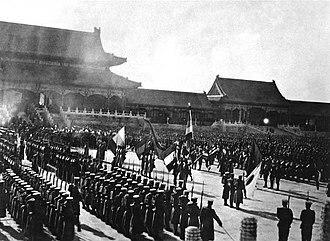 He reduced the role of a Governor to that of an Inspector (刺史), and permitted the Inspectors to administer only civil affairs in their respective provinces, while military affairs were handled by military personnel based in regional offices or in the capital. 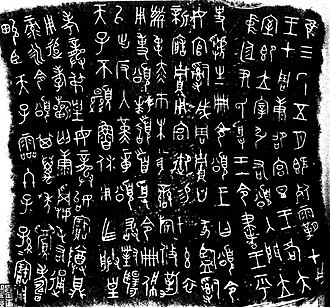 The kaishu style of Chinese calligraphy was developed at some time between the late Eastern Han dynasty and the Cao Wei dynasty, as well as the Jian'an poetry style. The first known master of the former was Zhong Yao, an official of Wei, of the latter; Cao Cao's son, Cao Zhi. Since the beginning of the Cao Wei dynasty, finding their roots in Cao Cao's administrative influences, intellectual constraints were relaxed, leading to the formation of new groups of intellectuals, such as, for instance, the Seven Sages of the Bamboo Grove. These freedoms were overturned by the time of the Jin dynasty (it was Sima Yi himself who associated with the orthodox Confucianists, who despised these new intellectual groups, and therefore were more willing to offer their support to the Sima clan). According to the Book of Wei, the Cao family descended from the Yellow Emperor through his grandson Zhuanxu. They were of the same lineage as Emperor Shun. Another account says that the Cao family descended from Emperor Shun. This account was attacked by Chiang Chi, who claimed that those with the family name "Tian" descended from Shun, but not those surnamed "Cao". 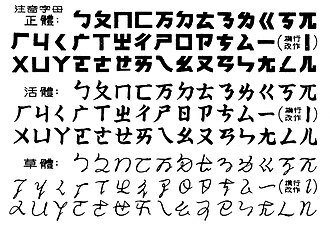 He also claimed that "Gui" (媯) was Emperor Shun's family name. 曹騰 (N/A) (N/A) Cao Teng's posthumous name was granted posthumously by Cao Rui. 曹嵩 (N/A) (N/A) Cao Song's posthumous name was granted posthumously by Cao Pi. 曹操 216-220 (N/A) Cao Cao's temple and posthumous names were granted posthumously by Cao Pi. Cao Fang became "Prince of Qi" (齊王) after his dethronement. He was posthumously granted the title "Duke Li of Shaoling" (邵陵厲公) in the Western Jin dynasty. Cao Mao was granted the posthumous name of "Duke of Gaogui" (高貴鄉公). ^ a b Cao Huan abdicated on the renxu (壬戌) day of the 12th month in the 1st year of the Taishi era of the reign of Emperor Wu of Jin. This date corresponds to 4 February 266 in the Gregorian calendar. ^ This figure, based on numbers given in the Sanguozhi, has been called into question since the census system is claimed to have been flawed. The actual population is likely to be far greater. Tanner (2009) estimates the population of Wei to be over ⅔ of the Han population. ^ On the bingyin (丙寅) day of the 12th month of the 1st year of the Taishi era, Sima Yan became emperor and adopted "Taishi" (泰始) as the era name of his reign. This date corresponds to 8 February 266 in the Gregorian calendar. Spring, first month (Feb. 15 - Mar. 15). The Emperor was about to come to Xu-chang when the south gate of Xu-chang collapsed from some unexplained cause. The Emperor was displeased at this and did not enter the city. Chronicles of the Three Kingdoms, Achilles Fang. In the tenth month of 220 (November), various ministers proposed that Cao Pi replace Liu Xie as the emperor, citing various astrological signs. 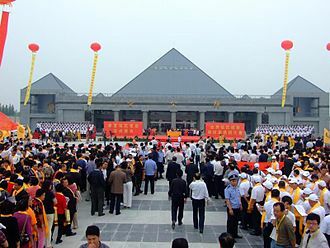 On November 25, Liu Xie performed various ceremonies in preparation for abdicating the throne. On December 11, Liu Xie formally abdicated the throne and Cao Pi ascended as the new emperor. To Establish Peace, Rafe de Crespigny. ^ ([泰始元年]十二月，壬戌，魏帝禪位于晉；) Zizhi Tongjian vol. 79. ^ Zou Jiwan (Chinese: 鄒紀萬), Zhongguo Tongshi - Weijin Nanbeichao Shi 中國通史·魏晉南北朝史, (1992). ^ Institute of Advanced Studies (December 1991). Barme, Gerome, ed. Easy Asian History: THE CONTINUATION OF Papers on Far Eastern History (PDF) (Number 2 ed.). Canberra, Australia: Australian National University. pp. 149–152. Retrieved 29 March 2015. The Emperor sent a sealed edict to summon Gongsun Yuan. In the end, Gongsun Yuan arose in an armed rebellion, meeting Guanqiu Jian at Liaosui. It so happened that it rained for more than ten days and the water of Liaosui rose greatly. Guanqiu Jian fought him, but was unsuccessful and withdrew his troops to Youbeiping. The Emperor summoned Sima Yi from Chang'an and had him lead an army of forty thousand men in a campaign against Liaodong. On the day ren-wu (September 29), Xiangping fell. 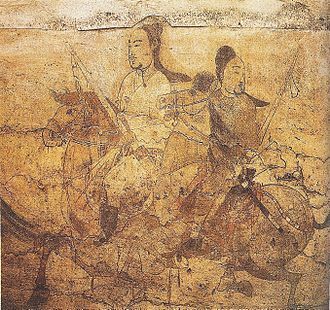 Gongsun Yuan and his son Gongsun Xiu, leading several hundred mounted men, got through the encirclement and fled towards the southeast. The large Wei forces instantly struck at them and killed Gongsun Yuan and his son on the Liangshui. ^ ([泰始元年十二月]丙寅，王卽皇帝位，大赦，改元。) Zizhi Tongjian vol. 79. ^ Howard L. Goodman (1998). Ts'ao P'i transcendent: the political culture of dynasty-founding in China at the end of the Han (illustrated ed.). Psychology Press. p. 70. ISBN 0-9666300-0-9. Retrieved 2012-04-01. Xuchang is a prefecture-level city in central Henan province in Central China. It borders the capital of Zhengzhou to the northwest, Kaifeng to the northeast, Zhoukou to the east, Luohe to the southeast. Its population was 4,307,488 inhabitants at the final 2010 census, of whom 1,952,666 lived in the area made up of Weidu district, Xuchang county. 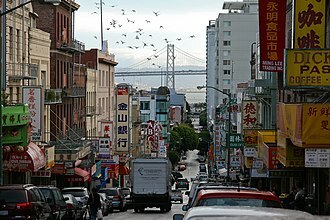 In 2007, the city was named as one of Chinas top ten cities by Chinese Cities Brand Value Report. The prefecture-level city of Xuchang administers 2 district,2 county-level cities and 2 counties, in ancient times, the city occupied a strategic location in central China. Xuchang served as the warlord Cao Caos de facto capital during the late Eastern Han Dynasty, after finding the old capital Luoyang ravaged by war, Cao moved the imperial court and Emperor Xian to what is now Xuchang in 196. In 220, Cao Caos son and successor Cao Pi officially declared the city as the capital of the established state of Cao Wei. The city was renamed Xuchang, meaning Xu Rising, the Wei emperors held court at Xuchang until the capital was moved to Luoyang in the 220s. The Xia dynasty is the first dynasty in traditional Chinese history. It is described in ancient historical chronicles such as the Bamboo Annals, the Classic of History, according to tradition, the dynasty was established by the legendary Yu the Great after Shun, the last of the Five Emperors gave his throne to him. 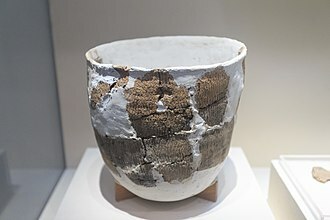 The Xia was succeeded by the Shang dynasty, the Xia–Shang–Zhou Chronology Project concluded that the Xia existed between 2070 and 1600 BCE. The first documentary reference to the Xia dates from more than a years later. 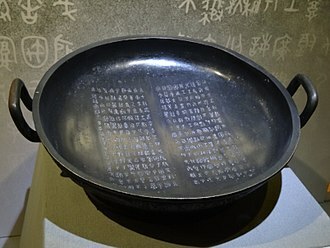 Therefore, despite efforts by Chinese archaeologists to link the Xia with Bronze Age Erlitou archaeological sites, the Xia dynasty was described in classic texts such as the Classic of History, the Bamboo Annals, and the Records of the Grand Historian by Sima Qian. According to tradition, the Huaxia were the people of the Han Chinese. Traditional histories trace the development of the Xia to the legendary Three Sovereigns, according to ancient Chinese texts, before the Xia dynasty was established, battles were frequent between the Xia tribe and Chi Yous tribe. 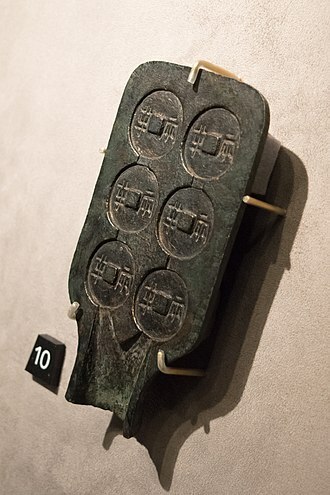 The Xia tribe slowly developed around the time of Zhuanxu, one of the Five Emperors, based on this, tradition ascribes the ancestry of the Xia clan to Zhuanxu. Gun, the father of Yu the Great, is the earliest recorded member of the Xia clan, when the Yellow River flooded, many tribes united together to control and stop the flooding. Gun was appointed by Emperor Yao to stop the flooding and he ordered the construction of large blockades to block the path of the water. The attempt of Gun to stop the flooding lasted for nine years, after nine years, Yao had already given his throne to Shun. Yu was highly trusted by Shun, so Shun appointed him to finish his fathers work, Yu was dedicated to his work. People praised his perseverance and were inspired, so much so that other tribes joined in the work, yus success in stopping the flooding increased agricultural production. The Xia tribes power increased and Yu became the leader of the surrounding tribes, soon afterwards Shun sent Yu to lead an army to suppress the Sanmiao tribe, which continuously abused the border tribes. 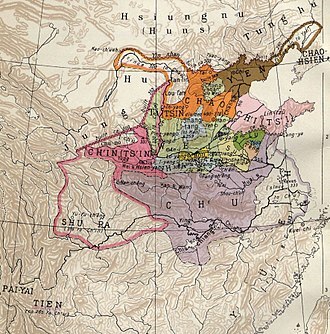 The period ended with the unification of northern China by the Northern Wei in the early 5th century. Cui Hong did not count several other kingdoms that appeared at the time including the Ran Wei, Zhai Wei, nor did he include the Northern Wei and its predecessor Dai, because the Northern Wei eventually became the ruling dynasty of northern China. Among the handful of the states founded by Han Chinese, several founders had close relations with ethnic minorities, the father of Ran Min, the founder of the Ran Wei, was adopted into a Jie ruling family. Feng Ba, who is considered by historians to be the founder of the Northern Yan, had been assimilated into Xianbei culture. Gao Yun, considered by historians to be the Northern Yan founder, was an ethnic Korean who had been adopted by Xianbei nobility. Due to fierce competition among the states and internal political instability, from 376 to 383, the Former Qin briefly unified northern China, but its collapse led to even greater political fragmentation. 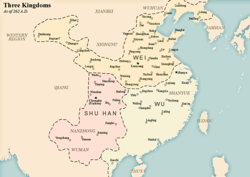 The Sixteen Kingdoms is considered to be one of the most chaotic periods in Chinese history, from the late Han Dynasty to the early Jin dynasty, large numbers of non-Han Chinese peoples living along Chinas northern periphery settled in northern China. Some of these such as the Xiongnu and Xianbei had been pastoralist nomads from the northern steppes. 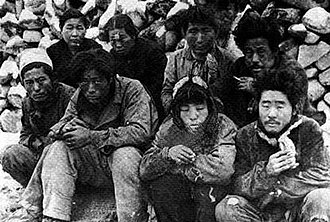 Others such as the Di and Qiang were farmers and herders from the mountains of western Sichuan, as migrants, they lived among Han Chinese and were sinified to varying degrees. Some attained official positions in the court and military and they faced discrimination and retained clan and tribal affiliations. The War of the Eight Princes during the reign of the second Jin ruler Emperor Hui severely divided and weakened imperial authority, hundreds of thousands were killed and millions were uprooted by the internecine fighting. Popular rebellions against heavy taxation and repression erupted throughout the country, in Sichuan, Li Xiong, a Di chieftain, led a successful rebellion and founded Cheng Han kingdom in 304. Shu or Shu Han was one of the three major states that competed for supremacy over China in the Three Kingdoms period. The state was based in the area around present-day Sichuan and Chongqing, towards the end of the Eastern Han dynasty, Liu Bei, a warlord and distant relative of the Han imperial clan, rallied the support of many capable followers. Following the counsel of his advisor, Zhuge Liang, and Zhuges Longzhong Plan, Liu Bei took over Yi Province from the warlord Liu Zhang between 212 and 215 and wrestled control of Hanzhong from his rival Cao Cao in 219. From the territories he gained, Liu Bei established a position for himself in China during the years of the Han dynasty. However, in 219, the alliance between Liu Bei and his ally, Sun Quan, was broken when Sun sent his general Lü Meng to invade Jing Province, Liu Bei lost his territories in Jing Province to Sun Quan. Guan Yu, the general guarding Liu Beis assets in Jing Province, was captured and executed by Sun Quans forces. Cao Cao died in 220 and was succeeded by his son, Cao Pi, Cao Pi established the state of Cao Wei and declared himself emperor. Liu Bei contested Cao Pis claim to the throne and proclaimed himself Emperor of Shu Han in 221. Although Liu Bei is widely seen as the founder of Shu, he never claimed to be the founder of a new dynasty, Liu Bei ruled as emperor for less than three years. In 222, he launched a campaign against Sun Quan to retake Jing Province and avenge Guan Yu, due to grave tactical mistakes, Liu Bei suffered a crushing defeat at the hands of Sun Quans general Lu Xun and lost the bulk of his army. He survived the battle and retreated to Baidicheng, where he died from illness a year later, Liu Beis son Liu Shan succeeded his father, making him the youngest of three rulers at only 16. Before his death, Liu Bei appointed the chancellor Zhuge Liang, Zhuge Liang was the de facto head of the Shu government throughout Liu Shans reign and was responsible for masterminding most of Shus policies during his regency. When Liu Shan succeeded his father, Shu was the weakest of the three major powers, following his fathers defeat in 221, the portion of Jing Province previously held by Shu was now firmly under the control of Wu. 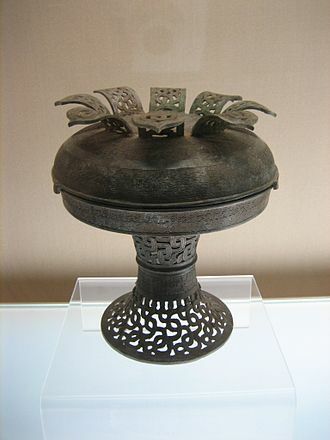 A jar made in Eastern Wu dating to the Three Kingdoms period. Before the dynasty of Eastern Wu was established, the territory was defended by the Sun clan in the Battle of Red Cliffs. Shu Han exported cotton into Eastern Wu. Celadon Storehouse and Courtyard. Wu Kingdom. Chariots and cavalry, detail of a mural from the Dahuting Tomb (打虎亭漢墓) of the late Eastern Han dynasty, located in Zhengzhou, Henan. A block print of Cao Pi wearing anachronistic clothing.